These articles are not intended for book reviews; however, it’s important to highlight specific books that have an important message about energy. For example, Wade Allison’s book, Radiation and Reason, was highlighted in the article, More on Radiation. The slow death of America’s nuclear power industry is largely the result of anti-nuclear activists convincing legislatures and Americans that nuclear power isn’t safe. The anti-nuclear crowd is wrong in this respect, and a new book by Meredith Angwin explains how average people can fight back against the antinuclear extremists. Her book, Campaigning for Clean Air, is a “how to” book for people who want to support nuclear power and counteract extremists. 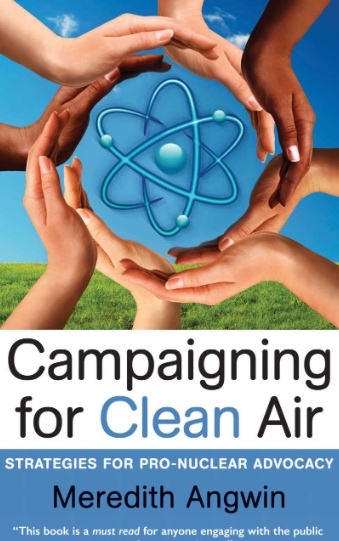 Campaigning for Clean Air also provides information about why nuclear power is safe and why the three nuclear accidents, Three Mile Island, Chernobyl and Fukushima, have not had the terrible consequences bandied about by extremists who oppose nuclear power. One note that struck a chord was her description of how manipulating sample size can create the impression that, “Redheads are taking over the world.” Extremists use this technique to mislead people. It’s similar to the misleading “97% of scientists agree” consensus statement that is repeated ad nauseam by the media about climate change. The “97% statement” is also based on a manipulation of sample size, while also distorting the truth, because nearly everyone agrees that climate is changing and that people have had some effect on climate. It’s also misleading because it doesn’t address the question: What’s causing global warming and climate change? Meredith Angwin has been an active supporter of nuclear power, and her book, Campaigning for Clean Air, describes many of her experiences. She uses these experiences to explain how anyone who is interested in this important energy source can support nuclear power and win over people and lawmakers, so they also support nuclear power. Keeping our existing nuclear power plants is even more important after the debacle with Westinghouse declaring bankruptcy, which threatens the completion of the four reactors currently under construction. Without popular support, nuclear power will continue its slow death in the United States, where there may be no nuclear power plants in operation by the end of this century. 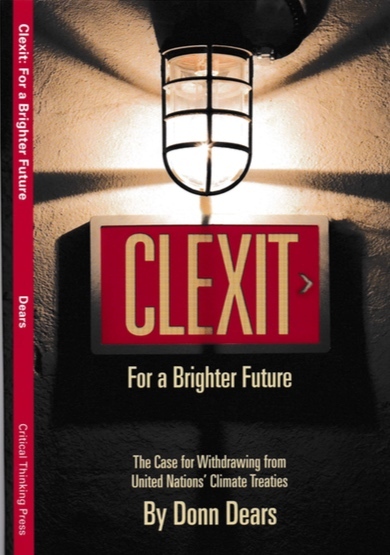 Clexit For a Brighter Future establishes why the United States should withdraw from the UNFCCC treaty, a treaty most Americans don’t know was ratified by the Senate. A coupon in Clexit allows the purchaser to also buy Nothing to Fear for $8.00. Clip the coupon and follow the mailing instructions to take advantage of this offer. © Power For USA, 2010 – 2017. Unauthorized use and/or duplication of this material without express and written permission from this blog’s author, Donn Dears LLC, is strictly prohibited. Excerpts and links may be used, provided that full and clear credit is given to Power For USA with appropriate and specific direction to the original content. Thanks for reviewing my friend Meredith’s book. Are you aware of what ThorCon is doing with advanced nuclear power? We’ve (of course) given up on the US and are focusing on the market in the developing world, especially SE Asia, especially Indonesia. You might check our website thorconpower.com after reading this new approach to Powering Up Our World. A critical number is the cost to construct, which for plants being built today is $6,000 / KW. Your article indicates a cost to build of $1,200 / KW, Frankly, I think you need to prove this cost. Too many people have made promises, such as cutting costs by building in a factory, that fail to materialize. If you can demonstrate a cost to build of under $3,000 / KW you will have a winner. Ultra-supercritical coal cost to build is approximately $2,700 / KW. By the way. I hold no trek with the false promise of wind and solar. They are way too costly, and fossil fuels will be around for a long while. I understand your skepticism on the capital cost of ThorCon. Here is a two-year old document that goes into cost detail. Current numbers are not public, but we are still confident that we will generate electric power cheaper than coal. One of the reasons that I think TMI was an accident, not sabotage, was that the same scenario occurred earlier at Davis Besse, but the operators were able to go off-book (so to speak) and figure out what to do. So the plant was okay in the Davis-Besse incident. Donn, do you have anything on just how”bad”the leak out of the Japanese reactor really is? Everything you hear out of the media makes it sound like everyone on the west coast is already dead, we just don’t know it yet. Roberthargraves: I read through the site you reference prior to writing the article where I mentioned Thorcon and before I made the above comments re cost to build. Donn, thank you for posting this! I think of my book as the “then what” book…if you are in favor of nuclear energy, “then what” do you do about it? The opponents often refer to Alinsky’s book, “Rules for Radicals,” but people who support nuclear are not usually happy with Alinsky techniques. My book is a guidebook for people who want to support our nuclear plants, but may not know where to start. It’s about how you can support nuclear energy, either rather quietly (at your computer) or in public. I think it fills a need. I am very grateful that you wrote about it. FWIW, I have very almost nothing about new types of nuclear energy (Thorcon, for example) in my book. I feel my techniques for supporting nuclear energy are general, and in all honesty, I have spent the vast majority of my time supporting existing plants. But when new types of plants start up, the techniques in my book should still work. A book lives for a while. It’s not a blog post. “Rules for Radicals” was published in 1989, and is still in use. So, in my book, I encourage people to be knowledgeable about about their local issues and then support their local nuclear plants. Maybe, someday soon, people will be buying my book to help them encourage local acceptance of Molten Salt Reactors. I hope my book will be useful to many people, over many years. This may be hubris on my part. I know my book is useful now, and I hope it will be useful in the future! Again, thank you for writing about it! Thank you. Your book takes a fundamental and practical approach to supporting nuclear power, no matter whether it is a new plant, or is an existing plant. The objective is to help people who want to support nuclear power.